Note: Newspaper clips on this page were obtained using my paid subscription to Newspapers.com, which I use often when writing articles for RF Cafe and other venues. Hmmm.... let us see what made the front page of the July 1, 1948 edition of Murray Hill, New Jersey's, The Madison Eagle newspaper: "Man Found Dead, Wedged in Drain on Park Edge," "Lawyer Fined $50 on Zone Charge," and Sandra Dean Stevenson had been born two weeks earlier. Oh, also included was "Invention Replaces Vacuum Tube" and "Local Man Invents New Device in Electronics for Bell Lab; Could Revolutionize Radio." 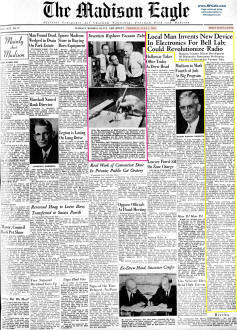 Page 10 ran, "Bell Laboratory Releases Data on Newly Invented Transistor." It is widely known that Drs. Brattain, Shockley, and Bardeen formerly announced on December 23, 1947, within the walls of Bell Labs in Murray Hills, their invention of the world's first semiconductor transistor with a gain of greater than unity. 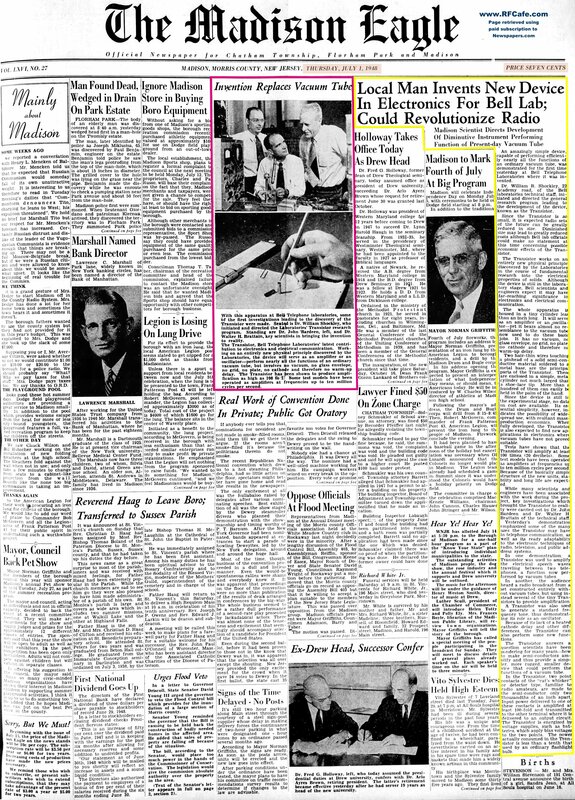 According to a search I did using my subscription to Newspapers.com, the earliest instance of a newspaper article about it was July 1, 1948. Wikipedia says Bell Labs kept the news contained until late June, 1948. "With this apparatus at Bell Telephone laboratories, some of the first investigations leading to the discovery of the Transistor were made. Seated is Dr. William Shockley, who initiated and directed the Laboratories' Transistor research program. Standing are Dr. John Bardeen, left, and Dr. Walter H. Brattain, key scientists in bringing the invention to reality. The Transistor, Bell Telephone Laboratories' latest contribution to electronics and electrical communication. Working on an entirely new physical principle discovered by the Laboratories, the device will serve as an amplifier or an oscillator - perform nearly all the functions of an ordinary vacuum tube, but involves no vacuum, no glass envelope, no grid, no plate, no cathode and therefore no warm-up delay. The Transistor has been shown to produce amplification as high as 100 to 1. Some test models have been operated as amplifiers at frequencies up to ten million cycles per second."